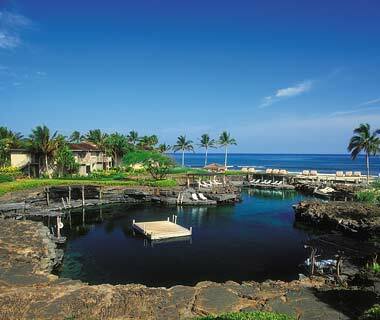 The Four Seasons at Hualalai won multiple accolades this year via Trip Advisor. It was named the No. 1 overall hotel and best luxury hotel in the USA and the world. The hotel also received mentions for its service, nabbing the No. 5 spot on the list of U.S. hotels with best service, and the No. 25 spot for best service in the world. It’s no surprise that the hotel and the resort itself offers guest some of the most unique and luxurious experiences during their stay. One of the attractions at the Four Seasons that’s a stand out is The King’s Pond. The King’s Pond offers regular Eagle Ray feedings, snorkeling lessons and a “fish circus” amongst the many activities you can enjoy with your family. The 1.8 million gallon “pool” itself is sculpted out of 200-year old lava rock and hosts both native flora and fauna, with at least 75 species of tropical fish swimming freely. To enjoy the King’s Pond while staying at Hualalai Hale, you may register for Hualalai’s Club Membership, which gives you access to all resort activities.